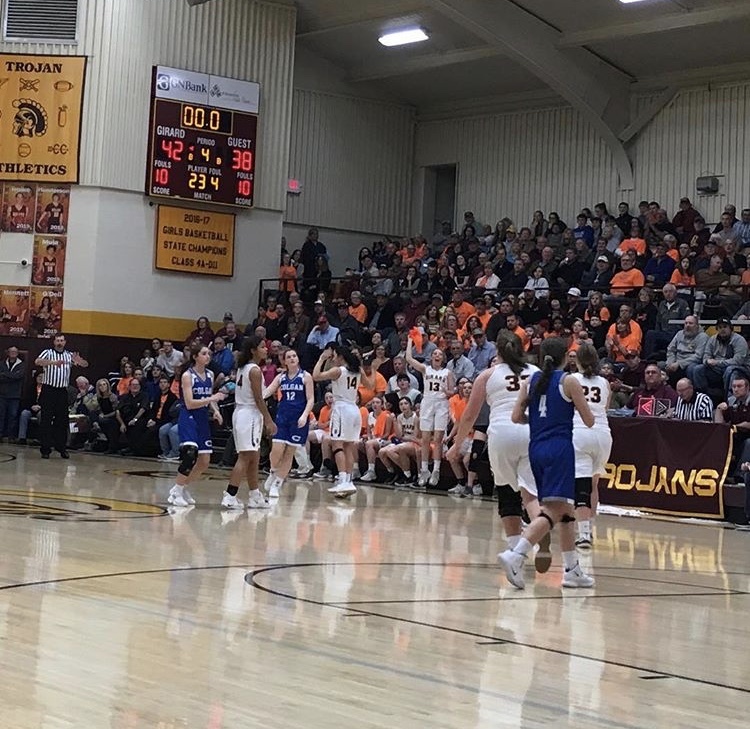 GIRARD—Both Trojan’s basketball teams came away with a pair of wins against the St. Mary’s Colgan Panthers Friday, Jan. 25 to make for a successful homecoming, with the girls finishing 42-38 and the boys 47-38. The Lady Trojans started at loss of a successful offense in the first half, but a third-quarter change of momentum turned the game around allowing them to stick a four-point lead. It wasn’t looking hopeful for the Lady Trojans as they came off their first half behind 13-22. A stellar offensive performance from Jordanne Ferguson and Kynze Smith led the Trojans to fight back 15 points to the Panthers two, ending the third quarter 28-26. The Trojans put in their all to hold onto their lead in the fourth. Once again, successful free throws lead the Trojans to victory 42-38. After finding their tempo in the second half, the Trojans secured a steady lead based off of offensive strengths from Caleb Muia and Evan Troike. back and forth with St. Mary’s Colgan to trail 7-9 in the first quarter. On a six-point strength of Muia, the Trojans stumble ahead 22-20 to end the first half. Carter Doherty and Troike also contributed several points and assists to their lead. Muia puts up three to kick start a shooting spree for the Trojans in the second half. Troike, Caden Lallemand, and Muia contribute to the Trojans; 10-point lead finishing the third quarter 33-23. As leading scorer for the Trojans, Muia secures the Trojans 47-38 win against St. Mary’s Colgan with two last-minute free throws in the last eight minutes of regulation.